Ever since 1562, Americans have relied on seaports to help move merchandise around the globe. Ever since the first commercial transaction was conducted by sea at Florida’s Port of Jacksonville in 1562, Americans have relied on seaports to help move merchandise around the globe. Today, ports don’t just include sea ports, but airports and river ports, too. Between these three modes, importing and exporting goods has become faster and more reliable than ever. Plus, with a vast network of on-site and third-party logistics (3PL) providers serving our ports, goods can get to their end user in record time. But not all ports are created equal. Some ports, like our Top 50 Power Ports, soar above and beyond others. Whether its processing more TEU’s of cargo than neighboring ports, collaborating on state-of-the-art port tracking software, or investing hundreds of millions of dollars into upgrades designed to accommodate anticipated future growth, these 50 ports all bring something unique to the logistics industry. The Port of South Louisiana earns the number one spot in the Top 50 Power Ports. The largest tonnage port in the entire western hemisphere, the Port of South Louisiana handled nearly 307 million short tons of cargo in 2017 alone. In fact, the port handles nearly 60 percent of the exports leaving Louisiana, and about 15 percent of all total US exports. The port spans an impressive 54 miles and holds 40 liquid and dry bulk terminals. Its also home to the most active Foreign Trade Zone in America- FTZ 124. The biggest port in Texas and the largest port on the Gulf Coast, the Port of Houston. The number two port in tonnage in the United States, the Port of Houston is the number one port in imports in the United States, handling an estimated 2.4 million containers in 2017, a 14 percent increase in volume since 2016. Because of this growth, the Port recently announced plans to invest hundreds of millions of dollars into expanding its capacity, and to improve its two existing container terminals. The Ports of New York and New Jersey have been operated together by the New York Port Authority since 1948. The third-largest port in the nation, the port authority has invested $2 billion dollars in both ports since the year 2000 to handle anticipated growth. In 2017, the ports set a cargo volume record, increasing volume by 5.3 percent over their 2015 record. 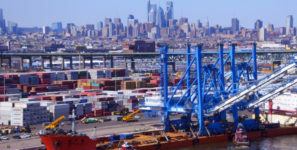 The busiest port on the East Coast, the Ports of New York and New Jersey handle nearly 30 percent of the East Coast market share. Officially created in 1896, the Port of New Orleans is now the fourth-largest port in the United States. In 2017, the port set a record for number of cruise passengers, marking the fourth year in a row that the port exceeded a million cruise passengers in a calendar year. Exports increased by $2.27 billion dollars in 2017. According to the Port Authority, the Port of New Orleans moves enough commodities annually to brew 20 million cups of coffee and bake 660 million chicken pot pies- just to name a few. The Port of Beaumont isn’t just the fifth-largest port in tonnage in the United States, it’s also the number one strategic military outload port in the entire world. With two terminals in separate counties, the port supports $1.8 billion dollars of economic output each year. The Port of Corpus Christi is the self-proclaimed Energy Port of the Americas. Strategically located between the Permian Basin and Eagle Ford, the port serves as an energy hub as well as a gateway to the Gulf of Mexico and the rest of the United States. But oil and gas aren’t the only energy products the port is accustomed to handling. In recent years they have also experienced an increase in the volume of wind turbine cargo they have processed as well. The 3200-acre Port of Long Beach not only handles an impressive 6.2 million TEU’s each year, it is also a popular cruise hub, having recently completed a $4 million-dollar expansion in its cruise terminal, which will increase passengers by about 40,000 a year. The port also holds the title of the second-busiest port in America, and the twentieth-busiest container cargo port in the world. The Port of Baton Rouge is a strategic gateway linking the Gulf of Mexico to the Mississippi river and 15,000 miles of Inland water. The port also offers a unique trait that you don’t see often: it is both a deep-water port (45’) as well as a shallow draft port. The number one container port in all North America, the Port of Los Angeles broke its own cargo movement record in 2017. That’s the most cargo moved in 110 years! The port covers 43 miles of waterfront, covering 41 percent of the West Coast market share. It is also proud to assist in the creation of the GE Transportation Port Optimizer information portal, which was designed to streamline operations and increase efficiency within the port. The Mobile, Alabama-based Port of Mobile spans 4000 acres across its five properties for a combined economic impact of $22.4 billion dollars. The only deep-water port in the State of Alabama, the port also holds the distinction of being the largest break-bulk forest products port in America. An extremely modernized port, the Port of Mobile has received $500 million dollars in improvements since 2000. Located just 20 miles south of the Port of New Orleans, Plaquemines is the closest port to open water along the Mississippi river. It is also the closest energy port to the Eastern Gulf of Mexico and is well equipped to handle petroleum products and oilfield supply vessels. Located in Lake Charles, Louisiana, the Port of Lake Charles was recently named the seventh-fastest growing port in the country by Forbes Magazine. To accommodate that growth, the port recently underwent an extensive traffic study which found that PLC was able to easily handle twice its current volume, and even expand further. In fact, an estimated $85 billion dollars in investments are scheduled to locate along the Calcasieu Ship Channel to take advantage of the port’s explosive growth. The deepest port on the East Coast, the Port of Virginia is considered a hub port, which provides direct connections to 30 international shipping lines with over 200 connections around the globe. The port is the fifth-largest container port in the nation, and fully authorized for future expansion. A 2065 master plan anticipates that the port will grow from around 2 million lifts to around 6 million in the next 47 years. The Port of Cincinnati is a 16-acre port which specializes in the loading and unloading of breakbulk. The 136-year-old port is a tri-modal facility which uses a conveyor system to quickly transfer cargo from ship to rail without it ever touching the ground. The Port’s location provides easy access to the Midwest, Canada and the Gulf of Mexico. Currently the port has over 100,000 square feet of indoor storage space but can easily accommodate more upon request. Primarily used to import crude oil and export fuels, chemicals and petroleum products, the Port of Texas City is in Galveston Bay. It is currently the ninth-largest deep-water port in America with a depth of 40-feet, but the port will soon begin expanding that number to 45 feet. The privately-owned port is also the fourth-largest port in the state of Texas, and due to its strategic location can save up to two days of travel time over other ports along the Houston Ship Channel. In 2017 alone, the Port of Baltimore handled 10.7 million tons of cargo, setting a record for the 62-year-old port. This comes after the port purchased an additional 70 acres of land in 2017 to accommodate current and future growth. The Port of Huntington Tri-State is the largest inland port in America. Located along the Ohio River, the Huntington, West Virginia port also has the distinction of being the sixth-largest port in the country. Located in coal country, the port processes roughly. The Port of Savannah is home to the single largest container port in North America. In fact, it’s the second-busiest container in the United States and the overall fourth-busiest port in the United States. Currently the Port of Savannah is undergoing an expansion that will bring its depth to approximately 50 feet. The project is estimated to be complete by the year 2020. The largest port in the State of Florida, the Port of Tampa is largest in terms of both size and volume. The most diversified port in Florida, the port is equipped to handle all major categories of cargo. The port is also strategically located along Florida’s I-4 Corridor, which houses the largest concentration of distribution centers in the country. It also is responsible for nearly 40 percent of exports to Latin America and the Caribbean. Located in Port Arthur, Texas, the Port of Port Arthur is located just 19 miles from the Gulf of Mexico and can handle almost any commodity. Expanded in the year 2000, the Port of Port Arthur paid close attention to the needs and wants of the maritime industry and the many industries that use the port. The port of St. Louis spans 70 miles along both sides of the Mississippi River, and is served by six Class One railroads, seven interstate highways, and two international airports. It also boasts access to two separate foreign trade zones. The port is the northernmost port on the Mississippi River that is bot port lock and ice-free year-round. The largest and farthest-inland freshwater port in America, the Port of Duluth-Superior is the self-proclaimed bulk capital of the Great Lakes, the port is located at on the western end of the Great Lakes / St. Lawrence Seaway. Based in Duluth, Minnesota, the full-service multimodal port spans 49 miles and is home to 20 private docks, a main terminal, tug and barge services, a fueling station and two dry docks. Located in Valdez, Alaska, the port of Valdez is the northernmost ice-free port in the United States. Strategically positioned at the base of the trans-Alaska pipeline (TAPS), the port provides easy access to the interior of Alaska, Canada, the Pacific Rim, the United States Pacific Northwest. The largest port in the state of Mississippi, the Port of Pascagoula is located on the state’s southeastern coast. Hosting a mix of public and private terminals, the port deals mostly in forest products, crude oil and chemicals. The 188-year-old port offers both 42’ and 38’ channels to handle a wide variety of vessels and cargo. The Port of Tacoma recently announced they have joined forces to become the Northwest Seaport Alliance, a strategic move that helps both ports better manage marine cargo operations. The third-largest cargo gate in North America, the Port of Tacoma handles everything from breakbulk to Automobiles, and even liquid bulk like molasses! The Port of Richmond is the number-one ranked port in the San Francisco bay for both liquid bulk and automobile tonnage. In 2010, the port underwent a $40-million-dollar renovation, enabling the port to load cars directly onto the rail without leaving the terminal- a move which better enabled the port to fulfill its agreement with Honda to import upwards of 180,000 Honda vehicles into the port each year. One of the busiest cruise ports in the world and one of the busiest container ports in Florida, Port Everglades spans from the cities of Fort Lauderdale to Hollywood, Florida. The 90-year-old port is Florida’s number-one seaport for petroleum imports. Currently the port is planning a channel-deepening and widening that will bring it from 42-feet-deep to 48-feet-deep. The Port of Seattle includes both the marine port and the Sea-Tac airport. Managed by a government agency, the port joined forces with the Port of Tacoma in 2015- forming what is now known as the Northwest Seaport Alliance. Together, the two ports have formed the third-largest cargo gateway in America. South Carolina’s Port of Charleston is currently undergoing a harbor deepening that when complete in two years will make the port the deepest on the entire East Coast, at 52-feet-deep. This expansion will easily accommodate New-Panamax vessels at any tide. The most productive port in North America, the Port of Charleston has received $10 billion in investments in the past four years. Now known as Philaport, the port of Philadelphia is more than 300 years old. But don’t let its age fool you- Philaport has recently undergone numerous improvements, including a channel deepening (to 45’) slated for completion later this year. Philaport has received a $300 million-dollar investment and will be getting two Post-Panamax cranes in early 2019, allowing the port to increase TEU’s from 500,000 to 900,000 per year. The Port of Pittsburgh spans 12 counties and 200 miles of Pennsylvania waterways, and over 200 river terminals. The second-busiest inland port in America, the Port of Pittsburgh connects to over 10,000 miles of waterways throughout the country. The Port of Portland encompasses Portland, Oregon’s Portland International Airport, as well as the city’s marine ports. The marine port is home to the state’s only deep-draft container port and contains three airports. The port also owns seven business parks around the greater Portland area. The port is the second largest exporter of wheat in the nation, and the fifth-largest auto import gateway in America as well. Located in Freeport, Texas, Port Freeport will soon expand from 45’ deep to 55’ in coming years. One of the nation’s fastest growing ports, Port Freeport also has plans to build two additional berths, increasing their berthing space to 2,200 linear feet. This addition will allow the port to accommodate Panamax to Post-Panamax class vessels. The expansion will also increase the port’s TEU capacity to 800,000 TEU’s. Officially established in 1927, operates both a bustling maritime port and the Oakland International Airport. In 2009, the port completed its expansion to 50’ deep to remain competitive with other major California ports. Today, the Port of Oakland is the fifth-busiest container port in the United States. The port recently implemented an online shipping portal called Oakland Portal, which allows cargo owners and freight haulers single-point access to seaport operations. Known as Jaxport, Florida’s Port of Jacksonville is the state’s largest container port. Jaxport has recently undergone almost $1.5 billion dollars in improvements, with another $1 billion dollars on the way. These improvements include deepening the channel to 47,’ making the port the first East Coast port available to Panamax-class vessels. A soon-to-be complete automobile terminal will increase the port’s capacity to handle vehicles by 25 percent. Jaxport also has over 120 million square feet of available distribution center and warehousing space. The first marine terminal to open in 50 years along the Delaware River, the Port of Paulsboro officially opened on March 1, 2017. Located in Paulsboro, New Jersey, the 190-acre port will soon have a deep water omniport, capable of processing both bulk and breakbulk cargo. The largest port in the State of Massachusetts, the Port of Boston falls under the Massport umbrella, which includes the Conley Terminal, Logan Airport, Flynn Cruise Terminal, Hanscom Field and Worcester International Airport. Conley terminal boasts a state-of-the-art, 10-lane gate facility, complete with a computer tracking system. The port is strategically positioned near several major highways, including I-95, which runs up and down the entire east coast. The Port of Chicago is an inland port positioned along the Calumet River. The 8,930,000 square foot port offers 3,000 linear feet of ship berthing. Spanning 1,600 acres, the port also has storage along Lake Calumet and Lake Michigan. The port of Marcus Hook, Pennsylvania has some interesting history. Once a popular stop for 18th century pirates, the port is said to have been frequented by the infamous pirate Edward Teach, aka Blackbeard. Situated along the Delaware River, the Port of Marcus Hook sits at the very southeastern corner of the state. A deep-water port, the chief export of the port is crude oil. Located along Lake Superior’s northern shore, Minnesota’s Port of Two Harbors is a deep draft commercial harbor. Initially developed as an iron ore processing establishment, today Two Harbors still deals primarily in iron ore and taconite, though they have added timber to their exports as well. Washington’s Port of Kalama is situated just 30 minutes north of Portland, Oregon, along the Columbia River. The port has a 43’ deep draft navigation channel and encompasses five miles of riverfront space. Additionally, the Port of Kalama has ample shovel ready and move-in ready facilities, as well as an office park, and easy access to a variety of transportation modes, including rail, highway and river. The Port of Honolulu handles over 80 percent of Hawaii’s required goods. A popular cruise spot, the port processes 11 million tons of cargo each year. It is also the only harbor in the United States to combine a visitor’s attraction, retail and restaurant outlets and working commercial harbor facilities in a single location. The largest seaport in Michigan, the Port of Detroit is located along the Michigan River. The 80-acre port’s number-one commodity is steel, and its number-one commodity by tonnage is ore, thanks to the city’s auto industry. The Port of Detroit sees over 1300 vessel arrivals annually. The Port of Longview, Washington is located along the deep-draft Columbia River, just 66 miles inland of the Pacific Ocean. The port is currently set up to process both bulk and breakbulk cargo, and specializes in handling everything from fertilizer to steel, paper and lumber. In 2010, the port purchased an additional 280 acres of land at Barlow Point. The land is currently on phase-two of a multi-phase study to test its viability as a port. The third-largest port in the Great Lakes, the Port of Cleveland is also the first major port of call in the great lakes. The port sits at the mouth of the Cuyahoga River on Lake Erie and has a full seaway depth of 27’ at all times. The port has a 45-acre bulk terminal, as well as an 80-acre general cargo operation. It deals primarily in iron ore, steel, limestone and wind energy and other large pieces of machinery and equipment. Located 18 nautical miles from Chicago, the Port of Indiana-Burns Harbor is located in Portage, Indiana. The port handles international cargo which is sent through the St. Lawrence Seaway and on to the Atlantic Ocean. Offering multimodal connections, onsite healthcare and round-the-clock security, the port is a popular spot for onsite warehousing. The Port of Indiana-Burns is dredged to a minimum 27’ feet, and the port’s Burns Waterway Small Boat Harbor is dredged to a depth of 6 feet, to accommodate small vessels. The fifth-largest inland port in America, Tennessee’s Port of Memphis is the second-largest inland port on the shallow draft section of the Mississippi River. The port is amply equipped to handle heavy intermodal transportation and covers both the Tennessee and Arkansas sides of the Mississippi River. The port spans 15 miles and is home to 68 water-fronted facilities. The Port of San Juan is comprised of 16 piers situated around San Juan Bay in Puerto Rico. Of those, eight piers are cargo piers, and the other eight are passenger piers used for cruise ships. Currently, the Port of San Juan has more than 500,000 sf available for loading an unloading cargo. The Port of San Juan’s six navigational channels range in depth from 42’ feet to 32’ feet. Recently, the port integrated a state of the art security system which has 153 cameras and spans 11 miles of bay. Located in the Strait of Juan de Fuca, Washington’s Port of Anacortes is positioned halfway between Seattle and Vancouver, British Columbia. With two piers and one wharf, the port has depths of 23’ feet, 37.6’ and 24’ respectively. The port also includes Anacortes Airport, which serves approximately 5,000 passengers each year. The 12th busiest airport in Washington State, Anacortes Airport has earned praise from the FAA for its impeccable grounds and facilities. Delaware’s Port of Wilmington is North America’s top port for imports of fresh fruit and juice concentrate. The port boasts the largest dockside cold storage facility in the country, and thanks to the presence of Dole, the Port of Wilmington is also America’s largest banana port. The 308-acre port is strategically located at the crossing of the Delaware and Christina Rivers. It is also minutes from the New Jersey Turnpike, as well as interstates I-495, I-95, and I-295. As America and the rest of the world become an increasingly global marketplace, the reliance on ports to import and export goods and materials has become an integral part of doing business. Shipping via sea is often more cost-effective, can accommodate larger volume shipments, and has a lower rate of accidental cargo loss than via other modes of transportation. Plus, with many businesses trying to reduce their carbon footprint, cargo ships are a greener, eco-friendlier option than both road and air transportation. If your business imports or exports goods and materials from elsewhere on earth, utilizing seaports to process your valuable cargo can be a financially and environmentally viable option. If ports are a deciding factor in your site selection process, each of these Top 50 Power Ports offer something unique to their customers. With so many choices, there’s ‘shore-ly’ a port that meets your business’s diverse needs. We thought it would be useful to see where each of our Power 50 Ports ranked in each category and take a cumulative score of their rankings to come up with an overall weighted ranking. We took each ranking for each port and combined them into a total weighted score. This gave them a total weighted score based on their ranking in each category. By adding each of these score we came up with their GT Overall Weighted Ranking which gave a slightly different perspective of each port. The diversity a port offered gave it a lower cumulative score. Just another way to look at the ports and get a quick reference on the diversification of each port. The lower the score… the better the diversification it offers.